Parenthood may be causing me to grow in ways I never thought possible. Four years ago, I never thought I would be a mum-blogger or writing my own online articles. I never thought I would be designing lanterns, making goop , gifts with recycled scrap, or attending workshops to learn about art. Our children are our biggest source of inspiration (and motivation) on this side of earth. Although I must confess, more so on good days than bad ones. When I see them running around happily, deep in the midst of learning something, exploring something they’ve never seen before, or being loving and kind to each other, it warms me to the belly. When I watch how they progress and grow, it also inspires me to be a better person for them. I suspect they are the ones who’ve taught me to appreciate beauty, nature, and creativity more. All this talk about inspiration makes me wonder: What do we want to inspire in our children? What do we want to breathe into their little lives? Which leads me to the next question. Have I been inspiring as a mother? Am I living my life well? Have I worked hard? Am I growing as a person? Am I successful in the things I deem most important like love, faith, and the upkeeping of family ties? More than the latest gadgets and toys, books and whizzy educational material, I think what our children need most is to see us live life with zest and faith, love and kindness. They need to see us walk the talk, and live out the values we want to them to breathe in: things like love, determination, perseverance, courage in the face of the storm, grace and forgiveness. It could be a picture post, or a wordy post. It doesn’t really matter what form it takes, the main objective is to share so that we can learn and grow together. I hope you will join me this Thursday onwards. Love the linky button! Will join as often as I can! Great linky idea! Will definitely aim to join in! Thanks for starting this… a good way to pause and reflect in the midst of all the whole parenting adventure. 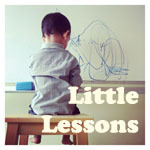 Thanks Serene, looking forward to your little lessons!